When the dad in your family has everything you should buy him a newer truck, so that is what we did. We decided he needed one with a few less miles and few less melted parts. 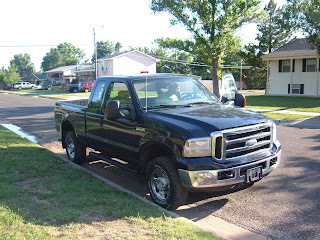 So, on Saturday we drove to Lubbock and picked up a 2005 F250 for him to enjoy. It has to park on the street for now since our other truck (we have lovingly named it "The Truck with Crust") is still in the driveway waiting for the insurance adjuster! Hope each of you had a fun and less eventful father's day weekend!! The new truck is beautiful. Are you sure Bryan didn't plan this?